In this four-part series, Bulatlat looks into the implications of the impending enactment of the Rice Tariffication Bill (RTB) on the Philippine rice industry and its impacts on farmers, consumers and other stakeholders. The RTB is a commitment of the Philippines to the World Trade Organization (WTO). It removes the quantitative restrictions on the importation of rice and paves the way for unbridled importation of the country’s staple food. Contrary to proponents’ claim that the RTB would bring down the price of rice, historical data show that the price of rice in the world market has been unstable. Since the country started importing rice from neighboring countries, the price of rice has continued to increase. Farmers fear the beginning of the end of the Philippine rice industry with the passage of RTB. 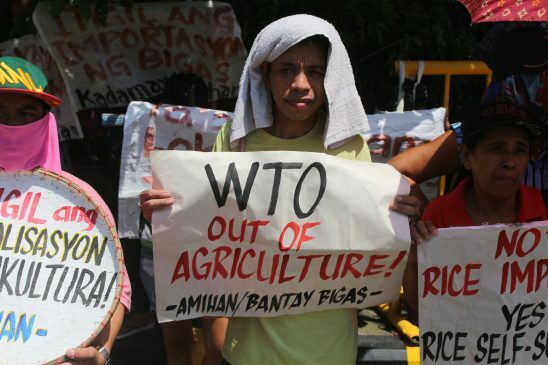 The agriculture sector, which has long been neglected by the Philippine government, stands to suffer from the government’s subservience to the dictates of WTO. More than 4,000 employees of the National Food Authority are expected to lose their jobs as RTB repeals the agency’s responsibilities and functions, including those that aim to protect the consumers. Farmers and advocates have provided alternatives to save and improve the sorry state of the Philippine rice industry and the country’s agriculture sector in general. Unfortunately, those in power choose to ignore these doable proposals.